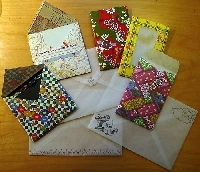 For this swap, you will create a handmade envelope. You can create it using anything you want, any material, just make sure it is sturdy enough to go through the post office. Design it however you choose. Inside you should add at least two items, sender's choice. Items could be notecards, trinkets, used postage stamps, postcards, stamped images, stickers, washi tape, etc. Make sure you add a note with the swap name and your user id. You will send it to 1 partner. Rate a 5 if your partner has met all the swap requirements, hearts are up to you. Must have a rating of 4.98. No recent 1's or 3's. I will check profiles.I will angel this swap ONLY after you have contacted the person who is supposed to send to you, you haven't received a reply and you have rated a 1. This is sender's choice so even if you do not like what you receive you cannot rate down. Please take into consideration, we are swapping with people from all over the world and mail systems can vary from country to country. Some are great, some are terrible. You may have to wait 3 months or more for a swap to reach you or your partner. Please do not be in such a hurry to rate a 1 or a 3. If you can't wait that long, do not join international swaps. Attn: New People. Please join the newbie helpers group and read the thread about how to fill out your profile. It is also full of information to help you navigate through swap-bot. There is a Make an Envelope group if interested for just USA addresses.